DeNeve Insurance Agency introduces a fundraising campaign for a local man whose radiation treatments to fight a rare and aggressive form of cancer left his body with devastating side effects, including the necessity of reconstructive jaw surgery and a long recuperation. We can only imagine the challenges faced by this poor family over the last several years. We want them to know that we care, and we truly hope the whole community will rally around them in their hour of need. DeNeve Insurance Agency’s caring team has selected the latest campaign in their ongoing community enrichment program, this time focusing support on a local man named Jesse, whose long battle against a rare and aggressive form of cancer has left his body devastated by side effects. Reconstructive surgery of the jaw with a long recuperation is now required, leaving his family in severe financial distress. Donations to the family may now be made at: https://www.gofundme.com/3wcqvdmk. Jesse is a local husband and father who was diagnosed with a very and aggressive cancer called polyblastic lymphoma in 2012. 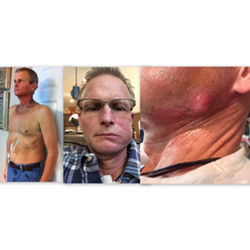 Two months into treatment at MD Anderson, Jesse found he had been misdiagnosed, and that he actually was suffering from squamous cell carcinoma of the head and neck. Extreme radiation treatments caused Jesse to lose 85 pounds and his sense of taste, as well as developing other side effects, including a condition called osteoradionecrosis or ‘bone death’, which has caused his jaw to become infected and rot. Immediate reconstructive surgery of Jesse’s mandible is absolutely essential. Barring any complications, Jesse’s recovery will take 3 months, during which he will be on a feeding tube and will need to be trained to walk again. Understandably, Jesse’s long battle has already drained the family’s savings and his retirement fund. Making it easy for everyone to help Jessie and his family, the agency has pledged to donate $10 for each and every person recommended to the agency. Those willing to help spread the word about this worthy cause may recommend someone they know for an insurance evaluation for their home, car, life, or more, with no purchase necessary. To view the campaign, recommend a friend or make a personal donation, readers may visit: http://www.deneveinsurance.com/Lets-Help-Jesse-Get-Back-On-His-Feet_15_community_cause. DeNeve Insurance is activating social media and an email awareness campaign, as well as dedicating a full page of their monthly magazine to feature all the details of the initiative for Jesse. The electronic version of the current issue of Our Hometown magazine, which is delivered to thousands of households in Houston and surrounding areas, may be viewed here: http://www.deneveinsurance.com/Our-Hometown-Magazine_46. DeNeve Insurance has promised to continue working for deserving local causes as part of their commitment to operate as Agents of Change in the community. Concerned members of the community may submit information on a group, family or person to be considered for future campaigns through this link: http://www.deneveinsurance.com/Add-Community-Cause_45. Selected ideas will be contacted by a representative of the agency’s Community Program. Readers interested in viewing past campaigns supported by DeNeve Insurance may visit http://www.deneveinsurance.com/community-cause. More information on the agency may be found at: http://www.deneveinsurance.com/. A full service firm serving families from offices in Detroit, DeNeve Insurance has one simple mission: to provide the finest insurance and financial services in the industry, while delivering consistently superior service. The primary focus of Wes DeNeve and his team of dedicated professionals is to protect all the things which are most important to their clients (their families, homes, cars and more), and in helping to prepare long-term strategies to enable financial success. To reach a caring agent at DeNeve Insurance Agency, please call 281-597-0700.